Read more about What’s Wrong With Blasphemy. How do we achieve the end of “blasphemy” laws? End all blasphemy laws may seem like an impossible, or at least multi-generational challenge! But the world has made a lot of progress on many social issues in recent years and decades, there is some value to being optimistic, and no human right or freedom was ever won without some effort! So how do we start? Blasphemy out of Europe, out of “western” states: We want to see the remaining laws against blasphemy and religious insult in Europe, Canada, and New Zealand repealed. Despite the clear international human rights consensus against blasphemy laws, there is an obvious double-standard at work when, for example, the European Union has taken a clear stand against blasphemy laws internationally, but some of its Members States cling on to existing anti-“blasphemy” legislation. It must be abolished, and although there’s no reason in principle that western states must repeal such laws first, there is a clear historical direction of travel, and in abolishing “blasphemy” in Europe and the “west”, promoting the international human rights consensus against “blasphemy” laws will become significantly more achievable. 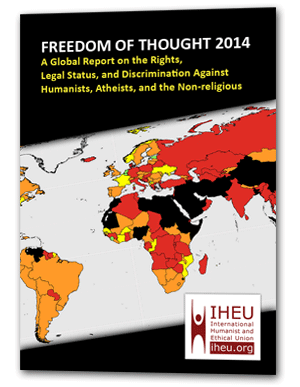 Defending and promoting the international human rights consensus against “blasphemy” laws: We want to increase understanding of the already-agreed international human rights treaties and other instruments among the public, and lawmakers themselves. We are calling on international bodies and world leaders to look on “blasphemy” laws as they might look on laws restricting press freedom: as a clear restriction on free expression and an indicator of wider social harm. A mutually supporting and robust international network: We want to see all advocates for freedom of expression against “blasphemy” laws around the world networked together, supporting each other, including secular, religious and human rights groups, human rights lawyers, and progressive lawmakers. Part of the problem of opposing “blasphemy” laws is that precisely where restrictions are most severe, advocates for free expression face the biggest challenges in speaking out. In Pakistan, calling for repeal of “blasphemy” laws has been declared “blasphemous”. In Saudi Arabia, for writing about unjust religious institutions, you can be jailed and flogged. In Mauritania, criticising the religious justification of modern slavery has earned a blogger a death sentence. Those of us in the most hard hit parts of the world need the most help. As a coalition we aim to make the most of our shared contacts and memberships to connect and support groups and individuals around the world. Reaching out to new partners, across religious and secular communities, human rights groups, and all advocates for freedom of expression, wherever they are in the world. Defending freedom of expression at international fora; advocating for the principle that no belief or idea must be protected from criticism or placed above satire, wherever our coalition partners have representation, including the Human Rights Council in Geneva, the United Nations in New York, UNESCO, the African Commission on Human and People’s Rights, the Council of Europe, and the European Parliament.